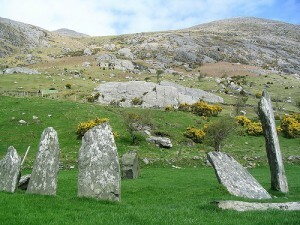 In simple terms stone circles are just that – rings of standing stones. While the world’s best known stone circle is Stonehenge, Irish stone circles tend to be smaller and composed of smaller stones. They are found most often in the North of Ireland, around Tyrone especially, and in the Cork-Kerry region, though there are scattered examples elsewhere. Most have a similar layout, with a larger gap between two of the stones, often two larger stones, forming and entrance, opposite which there is an ‘axial’ stone, often smaller than the others, sometimes flat rather than standing. Most are believed to have been built between 3000 and 1500 BC for a purpose which is not entirely clear. Occasionally bodies have been found during excavations, though not often enough to suggest that they were burial grounds. Nor do excavations tend to reveal artefacts, such as pottery or jewellry, so they are unlikely to have been places in daily use. Most authorities agree that they may have had a ritual or religious function. If you stand at the entrance of many stone Circle, facing the axial stone, you will be looking directly at the place of either the rising or setting sun at one of the solstices or equinoxes, leading to another theory that they were some sort of astronomical observatories. As many of Ireland’s stone circles are on private land, they can be hard to find and get to, and are often quite small and overgrown and a bit disappointing when you do. However they have great historical importance and, as a bonus, are usually in quite spectacularly beautiful locations. 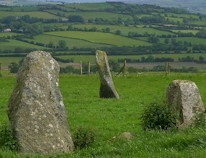 The Drombeg Stone Circle near Rosscarbery in Co Cork has been ‘restored’, many would say a little over enthusiastically and it is a lot less natural looking than Ardgroom. It has the advantage of being easy to find, but then there is the downside that there may be quite a few people around. The circle is aligned to sunrise at the Winter Solstice and 13 stones of the original 17 remain. The recumbent axial stone has 2 cup like depressions in it, of unknown significance. This is a circle where human remains were found – excavations in the late 1950s found cremated bones wrapped in thick cloth. Nearby there are the remains of two prehistoric stone huts, which are thought to have been occupied until the 5th century AD. Location: Between Rosscarbery and Glandore in Co Cork on the R597, about 2km from Glandore, 5km from Rosscarberry. 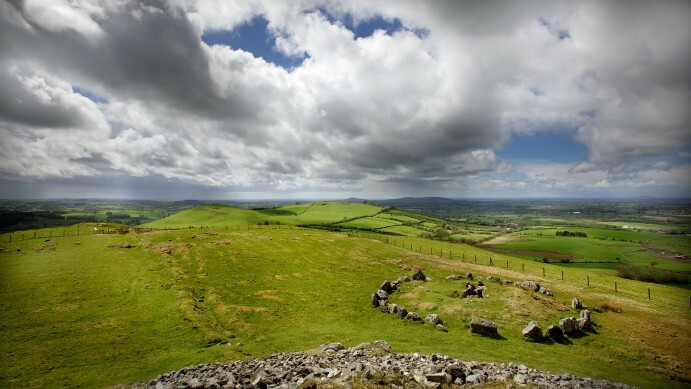 The area around Carrowmore has numerous megalithic remains, with more than 60 tombs, stone circles, passage graves and standing stones, of which the stone circle with a dolmen at its centre is the best known. The structures here date back some 6000 years though there is evidence to suggest that they were reused later during the bronze age and the iron age. A rounded hill in the background, called Knocknarea or Hill of the Kings, has not been excavated but almost certainly contains a passage tomb. 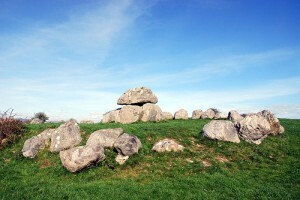 Legend has it that it is be burial place of Queen Medhbh, the mythical Queen of Connacht. There is a visitor centre at Carrowmore from which tours of the area are available and highly recommended. About 30km south of Sligo town. From Sligo, exit the N4 to the N17 (signposted Tobercurry). About 12km along this road Carrowmore is signposted to the right. It’s worth going here for the panoramic views over the Beara Peninsula and Kenmare Bay alone. 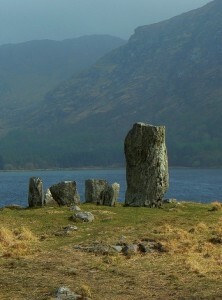 The circle comprises nine standing stones, the tallest about 2m in height, plus a prostrate stone around an 7m diameter circle. There is another single standing stone close to the circle. Location: Close to the village of Ardgroom, on the Beara Peninsula in Co. Cork, on the R571. Well signposted. 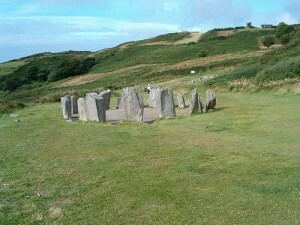 The Beltany stone cirle has 64 stones, though originally there were eighty or more, with an average height of 6 ft. Many of the stones lean outward from the circle at an acute angles, as a result of damage done by excavations at the site in past times. Built between 2000 and 3000 years ago, its purpose is not known, though it was probably associated with some form of religious ritual. The name certainly suggests a connection with the festival of Beltane, which in pagan times marked the end of the spring and the beginning of the summer. Location: A few miles south of Raphoe town in Co Donegal. It is well signposted. The Grange stone circle in County Limerick, which is the largest standing stone circle in Ireland, should be included in your list. It isn’t on private land so is easily accessible.